I read my first Kathleen Valentine book, Homemade Pie and Sausage/Killing Julie Morris in October 2011 and quickly followed it up with Ghosts of a Beach Town in Winter and The Mermaid's Tale. Since that time, Kathleen's books have become some of my favorites, with The Mermaid's Tale being listed in my all time top ten. Her books and stories continue to delight me, and her newest one, The Christmas Daughter: A Mariendstadt Story is no exception. But don't let the title fool you....although parts of this story take place around Christmas time, and Christmas definitely plays a roll in the story, this is not just a Christmas story. It is a story that can be enjoyed at any time, and should not be missed. Boone Wild left Marienstadt many years ago, but now that his father is dead, he returns home to help his mother sort things out and decides to stay and restore the family business to its former glory. Once the business is up and running, and during a New Year's Eve party at the Wilde Tavern, he receives a phone call from an old girlfriend who he hasn't seen in 13 years. She drops two bombshells; they have a twelve year old daughter named Charity, and Charity needs a place to live now that her mother is dying. Boone drops everything to rush to pick up Charity and bring her back to live in Marienstadt. This story was a delight from start to finish. As always, Kathleen's characters are wonderfully developed and easy to get involved with. In no time I found myself rooting for Boone and his new daughter, hoping that Boone could bring Charity out of her shell, and that Charity could help Boone settle down. I fell in love with the entire Wilde family, not only Boone and Charity, but also Sister John Paul and his mother, Winnie. By the end of the book, I found myself wishing that the Wilde's were my family and that I lived in Marienstadt. While this story was mainly about them, there were several minor characters in the story that caught my interest and that I am hoping play a bigger role in other Marienstadt stories. Yes, this story is not the first of Kathleen's Marienstadt stories. That said, reading the others is not a prerequisite to reading this story. Although I own the rest of the books in the series, (The Whiskey Bottle in the Wall, Volumes 1, 2, and 3) I have yet to be able to read them. However, that did not slow me down one bit while reading this story, nor did I feel lost by not reading the other stories. 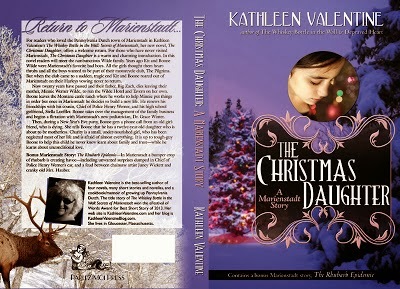 In fact, I was very pleased with the way that Kathleen was able to make The Christmas Daughter a story that was complete by itself, while still making me feel that there is much more to learn about the Wilde family and all of the other inhabitants of Marienstadt. My conclusion is that Marienstadt is a magical place that I would like to spend more time in. The people are friendly and multi-faceted, the area is steeped in tradition, and the values of the inhabitants are the type that appeal to me. I was actually delighted with the Pennsylvania Dutch background of the area and inhabitants and how similar it was to my Midwest German upbringing. I am eagerly looking forward to reading the rest of Kathleen's stories about this wonderful town and its people.